One of the things I loved having a front seat to watch was Ross’ pitch to reframe the concept of the Living Land into something even more compelling and fun to play in for new Torg players. 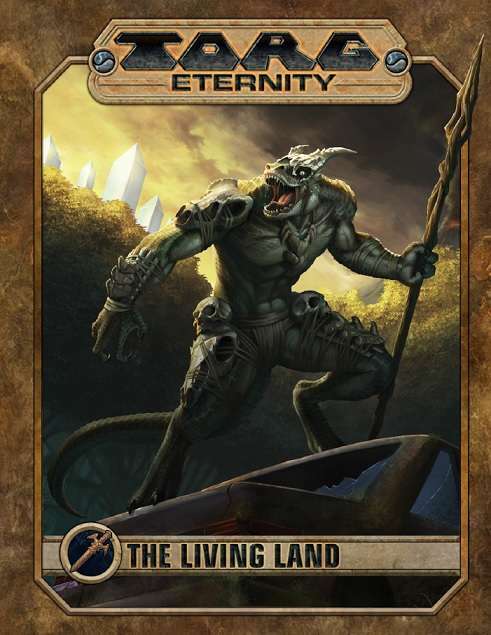 Today’s Celebrating Ross Watson Week Pick is the result of that extensive and creative effort – Torg Eternity – Living Land Sourcebook is a testament to “Lost World” style pulp adventuring and shades of “John Carter” among the native Martians can be felt as heroes interact with the edeinos while discovering the Law of Wonders. Don’t forget that the GM Day Sale continues for another four days from this posting. The Living Land is ruled by High Lord Baruk Kaah and his army of reptilian edeinos. It has taken over both coasts of the United States, the Yucatan Peninsula in Mexico, and the mysterious “White Zone” in Canada. Where the Living Land rules miraculous spiritual power is available, but technology rusts and fails. Ordinary humans—and even some heroes—regress and become ruled by their primal passions. There are amazing opportunities scattered among the Living Land‘s perils. The Law of Wonders insures that lost treasures appear in the misty and unexplored jungles. These treasures might have disappeared from Earth long ago or they may be relics from cosms destroyed by the High Lords. Whatever their different origins, they are resurfacing here and now, for adventurers bold enough to discover them! New Perks, Miracles, and Gear for players. New threats, foes, and plenty of dinosaurs! Details the different regions of the Living Land. Plot hooks and events from the first year of the Possibility Wars.